When NVIDIA initially briefed us on their new GM204 GPUs (aka Maxwell 2.0), there were several new features discussed. Most of these are now publicly available – Dynamic Scalable Resolution (DSR) was initially available only on GM204 GPUs but it was later enabled on Kepler and even Fermi GPUs. Other features required some changes to the hardware, for example Voxel Global Illumination (VXGI) cannot be implemented on older architectures – at least not without a severe performance hit. There was a third feature also discussed and demonstrated called Multi-Frame Anti-Aliasing (MFAA), and with their latest 344.75 driver NVIDIA MFAA is finally publicly available. Like VXGI, MFAA apparently requires new hardware to function, which means MFAA will only be enabled on GM204 GPUs – specifically, you need a GTX 980, GTX 970, GTX 980M, or GTX 970M GPU. Where things get a bit interesting is when we discuss exactly what it is that MFAA is doing. Anti-aliasing is used to smooth out edges of polygons in order to eliminate jaggies – the stair step edges that are created when a line is rendered on the pixel grid of a modern display. Many people despise jaggies, but there's one big issue with anti-aliasing: it can exact a pretty heavy performance penalty. Depending on your hardware and tolerance for jaggies, it's often necessary to balance the use of anti-aliasing with other aspects of image quality. It's worth noting at this point that there are many ways of accomplishing anti-aliasing. From an algorithmic point of view, the easiest approach is to simply render a scene at a higher resolution and then scale that image down with a high quality filter (e.g. bicubic), and in many ways this also produces the best overall result as everything on the screen gets anti-aliased. This method of anti-aliasing is called super-sampling (SSAA), and while it looks good it also tends to be the most costly in terms of performance. At the other end of the spectrum is multi-sample anti-aliasing (MSAA), which focuses only on polygon edges and samples multiple points for each pixel to determine coverage. This tends to be the least costly in terms of performance, but it doesn't always produce the best result unless you use at least four samples. 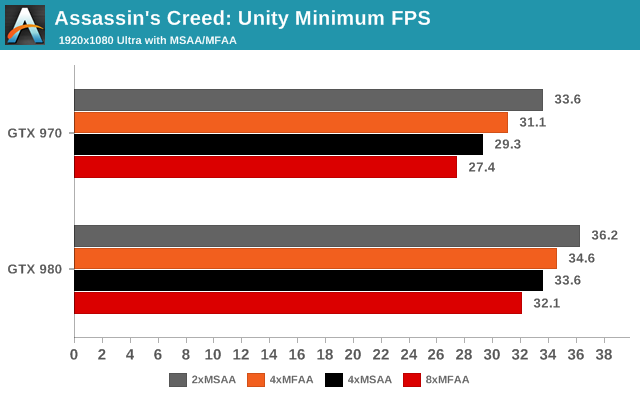 While NVIDIA's DSR is in many ways just a new take on SSAA, MFAA is a modification to MSAA plus a bit of extra "secret sauce". The sauce in this case consists of one hardware change – the sample patterns are now programmable and stored in RAM instead of ROM so they can be varies between frames or even within a frame – and there's also some form of inter-frame filtering. ATI (now AMD) first started doing this a while back as well, though not necessarily in the same way as NVIDIA is doing MFAA. 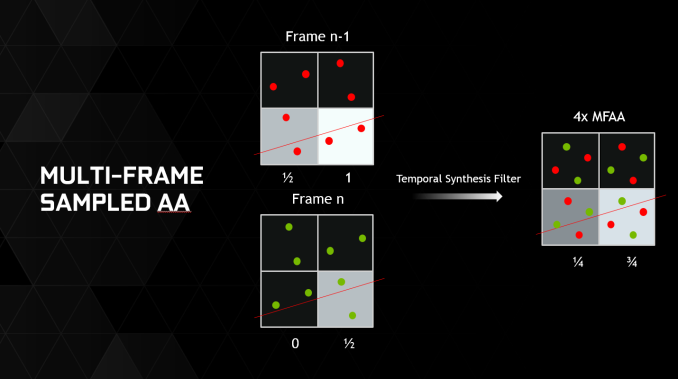 The idea is also similar to Temporal AA, which swaps sampling patterns every other frame in order to approximate 4xMSAA while only doing 2xMSAA, but now MFAA is doing some image synthesis over the frames to help detect and remove jaggies. NVIDIA's goal with MFAA is to provide quality that approaches the level of 4xMSAA with 4xMFAA (or 8xMSAA using 8xMFAA), with a performance cost closer to 2xMSAA/4xMSAA respectively. At a technicaly level, 4xMFAA is using an alternative 2xMSAA sample pattern combined with some inter-frame interpolation, while 8xMFAA uses alternating 4xMSAA sampling patterns with the filtering. Finally, let's also clear up how MFAA differs from TXAA. MFAA can be programmed to implement MSAA or TXAA, but it has additional flexibility as well, so effectively it's a superset of MSAA and TXAA. The key difference is that the sample patterns can now be altered rather than being hard-coded into ROM. 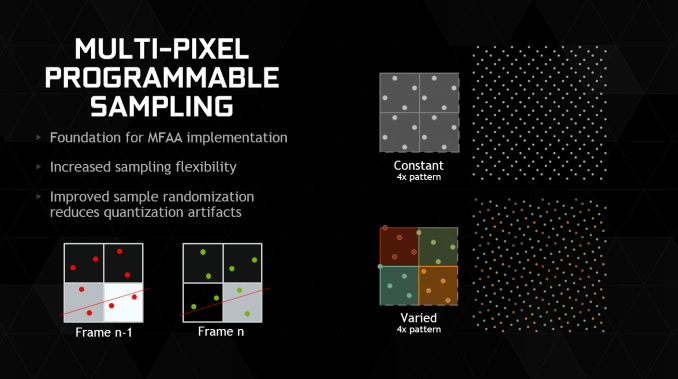 NVIDIA has also posted a video overview of MFAA and anti-aliasing in general that's worth watching if you're not familiar with some of the concepts. While the discussion of how MFAA works is interesting, ultimately it comes down to two questions: what is the performance hit of MFAA compared to MSAA, and what is the image quality comparison between MFAA and MSAA? To test this, we have used two games form NVIDIA's list of currently supported titles, Assassin's Creed: Unity and Crysis 3. The complete list of supported games (at the time of writing – more should be added over time) can be seen in the following table. I've actually got a separate Benchmarked piece with further investigations of Assassin's Creed: Unity (ACU), which I'll try to finish up later today. Suffice it to say that ACU is extremely demanding when it comes to GPU performance, particularly at the highest quality settings. For the testing of MFAA, I have used just a single GTX 970 and GTX 980 GPU, and I tested at 1080p with High and Ultra settings in ACU, while for Crysis 3 I used Very High textures with High and Very High machine spec. I then tested both with and without MFAA enabled (this is a new setting in the NVIDIA Control Panel). Here's how things look in terms of performance, with the minimum frame rates being an average of the lowest 1% of frames. There does appear to be a slight performance hit from enabling MFAA, though it's small enough that in most cases it wouldn't be noticeable without running benchmarks. Using 4xMFAA to deliver the equivalent of 4xMSAA looks to be viable, at least from the performance figures in our testing. The other aspect of course is image quality, so let's look at that as well. Here's where things get a bit interesting. It's a bit hard to compare them in the games we're using as you have to restart the game in order to enable/disable MFAA, so we can't just use a static shot (though the first image from ACU is basically a static location). I also feel like MFAA has a better chance to apply a temporal filter when the game isn't in motion, so I consider the "moving" sequences to be more important in some ways. Of course, when the game is in motion, seeing jaggies sometimes becomes more difficult (depending on the game and scene), but that's another topic…. Regardless, there are clearly differences between MSAA and MFAA in terms of rendering. 2xMSAA is easy to pick out as having the most jaggies still present, but picking a "best" image from the 4xMFAA, 4xMSAA, and 8xMFAA options would be hard. Then toss in the rain from the sequence in Crysis 3 and it becomes very difficult to see what's going on. One cool aspect of MFAA is that similar to TXAA, it has the ability to help remove jaggies on transparent textures and not just on polygon edges. You can see this on some of the elements in the above images (e.g. look at the fence in the second set of images for Assassin's Creed), though it's not always perfect. Still images don't often do anti-aliasing justice, so I went ahead and created videos of a scene in Paris with all eight supported anti-aliasing modes. Note that the process of transcoding and uploading to YouTube degrades the fidelity quite a bit and makes it difficult to compare AA modes, so this is at best a rough demonstration of the AA modes. The game natively supports no anti-aliasing, FXAA, 2xMSAA, 4xMSAA, 8xMSAA, and TXAA; with the updated drivers and MFAA enabled, 4xMFAA and 8xMFAA are also available. The most visible aliasing in the videos is on the facade of the building, and you can see some shimmer as there's a slight shift in the camera perspective over time. The top-right of the video has some dark wood highlighted against the sky and also shows some clear aliasing, as does the front of Arno's outfit. Of the various modes, FXAA seems to show the least aliasing (depending on where you look), but it also looks a little blurry overall. 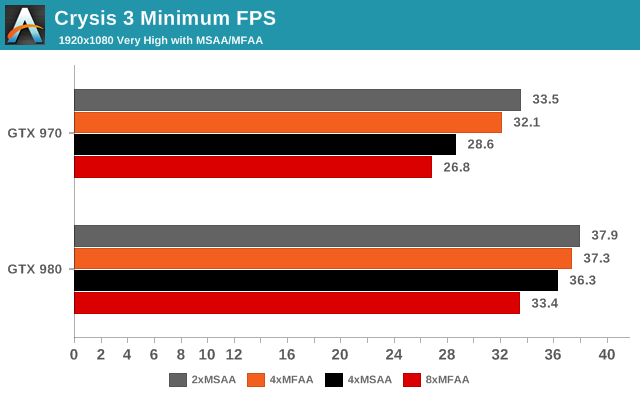 8xMSAA and TXAA look good, with the performance hit on 8xMSAA being quite heavy, and 4xMSAA and 4xMFAA are pretty close in quality as well. 2xMSAA meanwhile almost looks like the game doesn't have anti-aliasing enabled...until you actually see what the game looks like with no AA. I've seen at least one video of Assassin's Creed: Unity with MFAA enabled that showed some severe issues but I never experienced any such problems. If MFAA is rendering poorly on your system, drop me a note as I'd love to try and reproduce the problem. Wrapping things up, there are a few other items to note with the 344.75 drivers that we've used for testing. 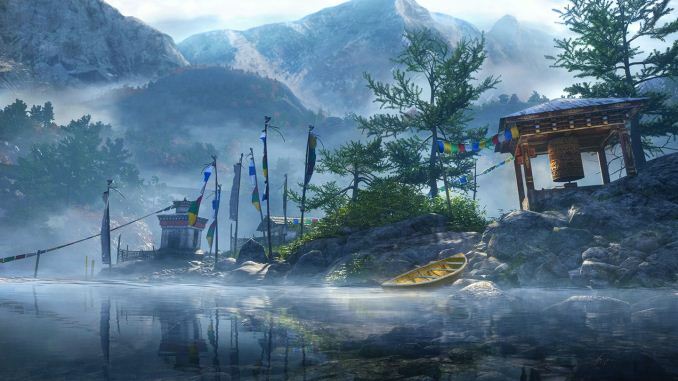 Along with enabling MFAA for GM204 graphics cards, the 344.75 drivers are NVIDIA's latest "Game Ready" WHQL release, with newly added support for Far Cry 4 and Dragon Age: Inquisition, and The Crew. The first two of those were officially launched today, November 18, while The Crew is currently slated for release on December 2. We're working to get those games for additional testing as part of our Benchmarked series of articles, so stay tuned for that. Getting rid of jaggies is always a good thing in my book, and if you can do it better/faster then that's great. While there's definitely going to be some debate on whether 4xMFAA actually looks as good as 4xMSAA, for the most part I think it's close enough that it's the way to go unless you're already hitting sufficiently high frame rates. The performance aspect on the other hand is a clear win, at least in the games we tested. Assassin's Creed: Unity and Crysis 3 can absolutely punish even high-end GPUs, but other games can be equally demanding at higher resolutions. Perhaps the biggest issue isn't whether or not 4xMFAA can produce a good approximation of 4xMSAA with less "work", but it's simply a question of support for MFAA. The current list of 20 games is hardly all-encompassing, and several of the games on the list aren't even known to be all that demanding (I'd put about half of the games on the list into that category, including DiRT 3, DiRT Showdown, F1 2013, F1 2014, Just Cause 2, and Saints Row IV). What we need now is more titles where MFAA will work, and hopefully that will come sooner rather than later. One nice thing with MFAA is that it currently ties into the existing MSAA support in games, so there's no need for extra programming work on the part of the developers (unlike TXAA). Of course there are drawbacks with MSAA, specifically the fact that it doesn't work with deferred rendering techniques, which is why some games only support FXAA or SSAA for anti-aliasing. MFAA doesn't do anything for such titles, but that's no surprise. Considering the performance benefit of MFAA over MSAA and the fact that it can be enabled in the control panel and will automatically work on supported games, I don't see much problem in simply leaving it enabled for most users. Aaaand they still haven't fixed DSR in combo with SLI and Gsync. I have a RoG Swift and 980 SLI. I can only use DSR if I disable SLI or use a different monitor. According to nVidia, support is coming in a later driver release. Oh, and this new feature doesn't work in SLI either. Yes, for years on end. and then still not fix it, for a few more years, then, the vaporware would be abandoned. 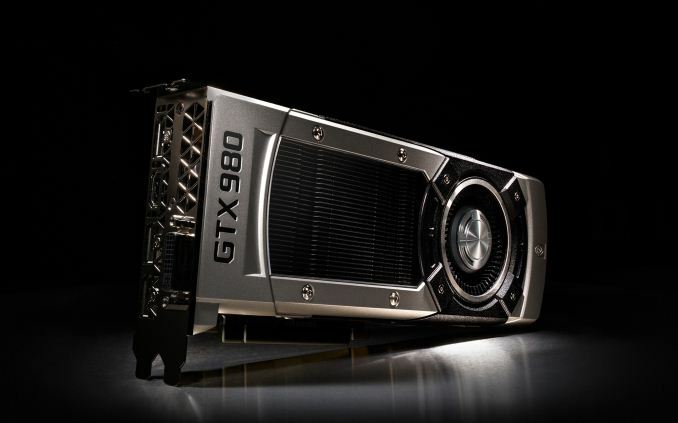 With nVidia however one can be supremely confident the repair is on the way quickly, and meanwhile one can enjoy the plethora of the other many and varied additional features AMD cards lack completely. Then, as in now, everything AMD complained about concerning the competition when AMD wore it's self proclaimed and false holier than thou halo, it has at the time or subsequently done in a much more vast and directly dark and corrupt manner, like the rampant and embarrassing direct re-branding, without even memory or bus or clockspeed or bit width changes nVidia always incorporated to vary the cores output. "when the game is in motion, seeing jaggies also becomes more difficult"